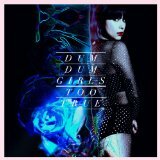 At the tail end of Dum Dum Girls’ debut, I Will, there appeared a cover of the Sonny and Cher track “Baby Don’t Go”. In the hands of Dee Dee Penny, the mid tempo 60s pop nugget was turned into a yearning torch song. It is this sophistication that drives most of the new album, Too True. Opener, “Cult of Love” features a reverb drenched, spaghetti western guitar line. Elsewhere, a touch of The Divinyls infects the vocals of “In The Wake Of You” and a programmed drumbeat drives punchy rocker “Little Minx”. A close touchstone to Too Truewould be Hole’s third album, Celebrity Skin. That was the point that Courtney Love left behind the post punk of earlier records and got more in touch with her inner Stevie Nicks and Carole King. Working with Richard Gottehrer and Sune Rose Wagner (The Raveonettes), Dee Dee forges a similar path on her third album. ““I’m reckless at night, I’m sorry for days” intones “Are You OK?” followed up by the album’s dreamy title track, “Too True”. Clocking in at almost exactly 30 minutes, Too True makes every minute count and easily lends itself to repeat listens.